The idea of a cane that can be stored and quickly unfolded for use makes me feel like James Bond—minus the poison darts obviously! 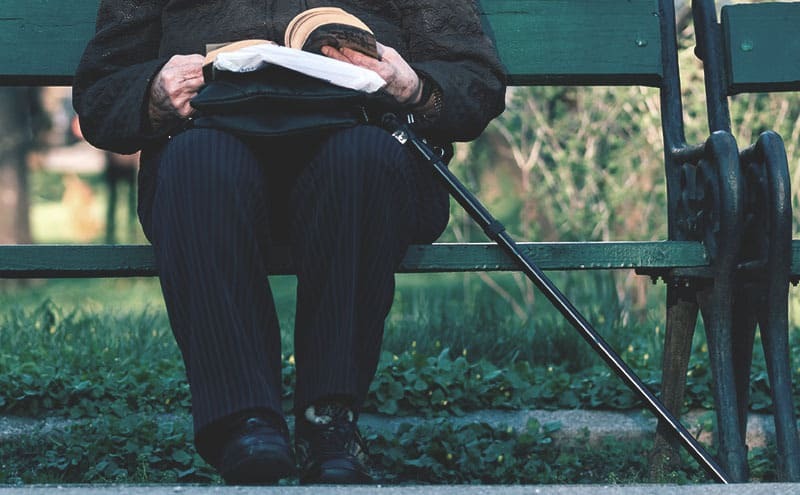 Many people, myself included, love the idea of a cane that can be tucked away out of sight when you’re not using it, yet quickly snaps open when your legs don’t want to do anything too quickly. The best collapsible canes are great for traveling and most are inexpensive too. Folding cane designs have become so much more stylish over recent years that I know people who own several collapsible canes. One or two canes may be kept for everyday use, with a slightly more fancy folding cane for evening use. A more streamlined or compact folding cane, often provided with a carry bag can be ideal for travel too. 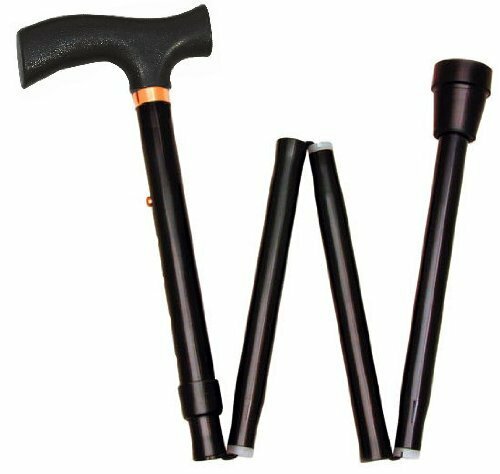 Let’s look at whether a folding cane is right for you and some features to consider when choosing the best collapsible walking cane. With so many options available, we’ve whittled it down to our favorite five collapsible canes to meet all your support needs, and maybe your secret agent fantasies too. Aluminium cane with four collapsible sections—folds down to 12 inches. Innovative soft grip technology is both ergonomic and antislip. In three colors; black bronze and metallic blue. America’s number one selling cane with SteadiGrip stabilizing technology. Customizable height from 30.5 to 37.5 inches and weight capacity of 350 pounds. Choice of four colors—original black/pathfinder purple/roadrunner red/trailblazer blue. 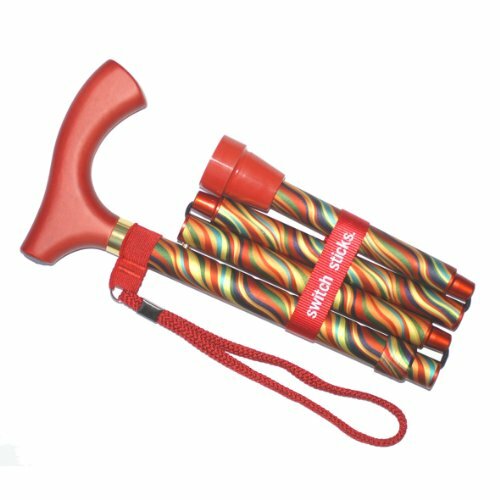 Stylish collapsible walking cane with choice of 20 colorful designs. Supports up to 264 pounds with slip-resistant rubber tip for extra traction. Folds for storage or travel and lightweight enough at 13.5 ounces to slip into a purse or briefcase. Foldable cane which adjusts to five height levels. Three built-in LED lights safely guide you in the dark—option with alarm/siren also available. Carry bag included and folds small enough to fit in your handbag. Heavy duty bariatric folding cane supports up to 500 pounds weight. Folds into four pieces to make transportation and storage easier. Fully adjustable height from 33 to 37 inches. Is a Folding Cane Right for You? Just because you may be a little unstable on your feet doesn’t mean you should miss out on some of life adventures. Some people even use a cane as a fashion accessory, with many more stylish models adding panache to their outfits. Sometimes I think a walking cane would help me on the way home from the bar on a Friday night, but maybe fewer glasses of wine would help more! As we get older, using a cane can be an ideal way to prevent mobility accidents or help with balance issues. A recent study of cane users over the age of 60, found 75 percent of the respondents who fell weren’t using their cane at the time. A folding cane is more portable and lightweight than many traditional mobility aids and something less likely to be left at home. Following an injury or surgery, a doctor may often recommend a patient uses a folding cane or retractable cane on a temporary as-needed basis. Always remember to check with your doctor before you use any folding cane or mobility aid. The handles used on canes vary in size, style and padding. An ergonomically designed handle will offer more comfort to the hands and relieve pressure from the wrist. If you suffer from arthritis or have sensitive skin and hands look for a cane with a padded foam handle for extra comfort of use. Once you’ve chosen the best collapsible cane for your needs, it’s important to ensure it can be fitted to your height. Too short a height will cause you to unnecessarily lean forward and increase the risk of a fall. If your cane is too tall, you won’t get the full benefit of its support of your body and an improved sense of balance. A too short or too tall cane can be an unsafe choice. It’s surprisingly simple to measure what size folding cane you need. With the help of a friend, stand upright in your normal daily shoes, and measure from the ground up to the crease in your wrist with straight arms. Just ensure your cane can be adjusted to the same height. The YouTube video below gives a few pointers on how to adjust the height of your collapsible cane for safer use. Most collapsible walking canes use a piece of elastic or strong rope-like material to hold the connecting pieces together and for easy folding. It’s not as easy to just trim a piece of the end if the cane is too tall. Always try to choose a cane with easy to adjust height and make sure it has a secure locking mechanism. Having a good grip at the tip of the cane is important for your balance and safety. Some collapsible canes may feature pivoted and/or wider feet ideal for more outdoor use and rougher terrains. A good rubber tip will add to the traction and stability of the cane as you walk. Don’t worry if the cane you choose comes with inferior tips as they’re often easy enough to replace. It’s important to choose a cane that won’t bend or buckle. 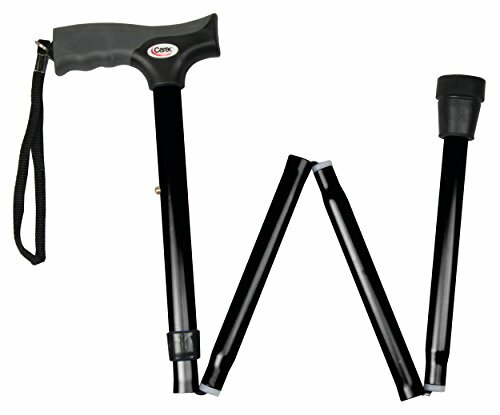 Most folding or collapsible walking canes are made from heavy duty aluminum tubing to be more lightweight. Normally aluminum canes will support anywhere between 240 to 300 pounds, although always check the specific cane’s maximum weight capacity. Heavier cane users may need to choose a more durable cane which will be made from steel. These will be heavier and take more effort to fold or unfold but will offer the added support your extra weight needs. Bariatric collapsible canes are available with weight capacities up to 500 pounds. Many of the collapsible canes we’ve looked at included carry pouches or support straps. A good-quality strap will help keep the cane in a closed position when folded up. The last thing you want is an auto-erecting cane—some people already have problems with things popping up when they shouldn’t! A wrist strap can add to your security when using a cane and there are models available which have built-in lights or sirens for safer use at night. Consider what extras you need before purchasing a collapsible cane. Many of the non-essential features are nice but just as easy to add to less expensive models. Choosing a folding walking cane can offer you that extra support when you’re on the go or traveling. We’ve looked at many of the top-selling canes available and here, in our opinion, are five options which could be the best collapsible walking cane to meet your needs. This collapsible cane from Carex Health is one of our favorites due to the cushy, soft grip that’s designed to be more comfortable in your hand. If you suffer from arthritis or have general weakness or pain in the wrist and hand, this soft-grip cane is ideal. The ergonomically shaped handle is easier to hold and less stressful on the wrist and fingers. A lightweight but strong aluminum shaft folds into four pieces for storage or travel, measuring only 12 inches when completely folded. When unfolded, the cane can be adjusted up to 35 inches tall and will support weights up to 250 pounds. A bargain-priced sturdy foldable cane that’ll fit in most large purses or bags for easy carrying. Lightweight yet sturdy foldable aluminum shaft. Folds down to 12 inches long. Soft grip technology reduces pressure on wrist. Anti-slip handle even when wet. Can be noisy when used with a loud clanking sound. Grip can get sticky on hotter days. No retainer strap means the cane folds open unless you use a very strong band of your own. Alongside comfort of use, stability provided by the cane is a key factor in choosing the best collapsible walking cane. HurryCane is well known for its innovative patented SteadiGrip stabilizing technology that increases traction and improves balance. The pivoting base gives the user a point of contact at all times with the cane and feels like an extension of the body. An easy push-button system allows you to choose seven height settings from 30.5 to 37.5 inches. Folded in seconds, the cane collapses to one-fifth of its original height and comes with included travel clips and a travel bag for easy carrying. 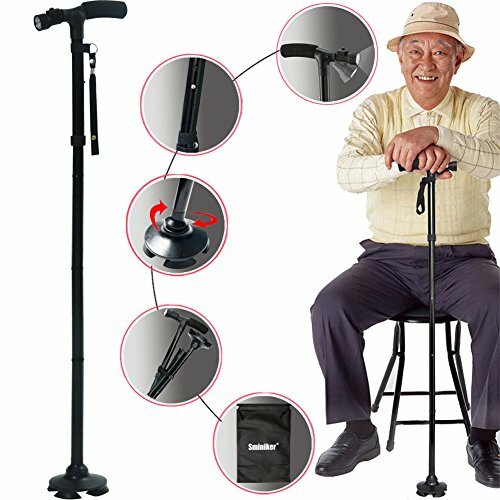 The HurryCane will even stand up by itself at your side when needed. Innovative SteadiGrip technology provides maximum stability. Included wrist strap and travel pouch. Will improve the user’s balance. May not stand up on its own on some surfaces like longer grass. Elastic straps tend to stretch loose causing a rattle. Aluminium is thinner than similar canes. For anybody looking to make a fashion statement with their cane, this foldable model comes in 20 striking designs and colors. A coordinated wood handle, wrist strap, Velcro band and rubber tip give the cane a polished look. It even comes packaged in an elegant gift box that showcases the artistic design. Folding down into four sections for easy storage and travel it includes a water-resistant pouch for extra portability. The height adjusts from 32 to 37 inches in 1-inch increments and weighs just 13.5 ounces. Ideal for slipping into a larger handbag or purse when folded. Slip resistant with ergonomically shaped handle to reduce hand cramping or fatigue. Strap easily fits around wrist to prevent dropping the cane. Easy to carry at only 13.5 ounces. Handle is too hard for some users. Paint on wooden handle chips easily. Difficult to fold up needing extra force to pull sections apart. What we really liked about this option for the best collapsible walking cane was the three built-in LED lights. When walking late night, this LED light will safely guide us home. A wide pivoting head promotes an easier and more balanced walking in all terrains and means the cane can stand by itself when left unattended. The four-footed base has a rubber tips which offer more grip, while a soft foam handle aims to provide comfort at the other end. Fully adjustable between 32.5 and 36 inches it collapses down to just over 14 inches. Easy to fold and unfold, the cane includes a convenient foldaway strap to prevent it from opening up again when being stowed away. Wrist strap and quad base for extra support. Three bright LED lights built-in for safety in darker conditions. Limited height adjustment makes this cane only suitable for average height users. Not as solid construction as similar-priced collapsible canes. Handle doesn’t have enough padding for many customers and can be uncomfortable. You may have thought heavier cane users would struggle to find a collapsible cane strong enough to support their extra weight. But his heavy duty collapsible cane supports weights up to 500 pounds. You can be assured this cane will only collapse when you want it to rather than buckling under too much weight. Made from a heavy duty steel tubing, this cane is the heaviest we looked at but also the most sturdy. With a sleek black finish and an attractive brass collar around the handle it doesn’t skimp on style either. Suitable for everyday use, the cane folds into four pieces for easy storage and travel. Ideal for heavier users and supports up to 500 pounds. Extremely sturdy and heavy duty. Included plastic clip to hang cane when folded. Takes more force to close than other folding canes. Steel tubing is much heavier than aluminum. Hard plastic handle can be uncomfortable. There’s no reason why you should miss out on life just because you’re a little unsteady on your feet. The best collapsible walking cane is something you can carry with you at all times for those occasions when you need a little extra support. When traveling, they’re easy to stash away and simply unfold for the next haul of your journey, whether it be crossing an airport to the next gate or hiking up the next hill. In our opinion, the Carex Soft Grip Folding Cane is the best collapsible walking cane easily available today. An ergonomic and anti-slip soft-grip handle makes the cane comfortable to use and reduces pressure on the wrist. It’s strong, elegant and stylish with a choice of black or metallic blue cane. Fully adjustable and quick to fold up, it comes with a handy carrying case at a hard to beat price. What Are the Best Crutches in 2019?